The other morning I made a trip to my local Save-A-Lot grocery store to pick up some things I needed for the week. I walked by the produce area and noticed a lot of the bell peppers had been packaged and reduced for a quick sale. I bought 9 green, yellow, and red bell peppers and paid only $4.59! Usually the peppers there are $1.59 each but I scored mine for $0.51 cents each. 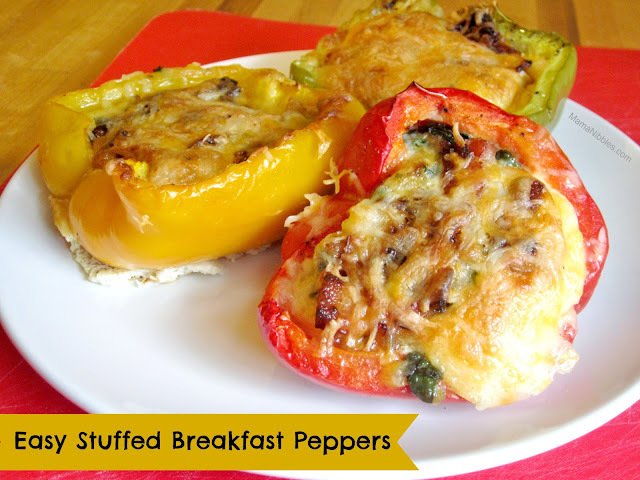 I kept on walking and thought that it might be fun to fill my peppers with some meat, cheese and eggs. I keep seeing filled peppers on Pinterest all the time and the thought was stuck in my head. I got to the dairy case and there were cartons of egg white that were reduced for $1.29 a piece. I saved another couple of bucks there. I then thought I should whisk a bit of milk into the egg whites and that was reduced for .99 cents for a quart that expired the next day. My family of five drinks milk fast so it would be no problem finishing that off. So right off the bat I found half of what I needed for under $7. I had a package of our favorite bacon from Aldi's in my fridge at home. Their thick cut hickory smoked bacon is literally the BEST bacon ever and it is under $6 for 1 1/2 lbs. I always bake my bacon on a rack set inside of a foil lined sheet pan for the best flavor and texture. I also had a cheap bag of fresh spinach for another $2, a tube of breakfast sausage for $2, and a bag of shredded cheese for $2. I had all I needed to make some delicious stuffed breakfast peppers and all of my ingredients cost me $15. Technically this could feed 8 people which was about $1.88 per person for me. I used four peppers to feed my family of five, the rest would be made into something else. I know that I am not the first to make this recipe but I did not look at any others when I prepared mine so who knows, maybe mine is different. Let's begin! 3. Slice your peppers in half through the stem, clean and rinse (I cut my stems out) Set the halves inside of the pan like little bowls. Sprinkle with salt and pepper. As you can see some of my eggs spilled out into the pan, most likely because I chopped out the stems. No worries because the cooked egg white in the bottom fed my 2 year old. The cooked egg was really soft and moist! He loved it. Every pepper was perfectly roasted and so flavorful! ENJOY!